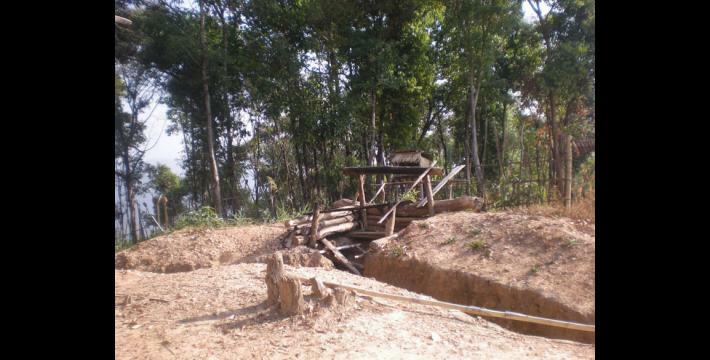 In the northernmost township of Papun District, Burma army troops deployed as part of an ongoing offensive in northern Karen State were withdrawn from 13 of 46 army camps in the district between the end of 2008 and the start of 2009. Although this has opened some space for villagers, they report continued patrols, restricted access to farmland and severe food shortages. Elsewhere in the district where SPDC control is more comprehensive, villagers report forced labour and land confiscation for road construction as well as conscription as 'human minesweepers' and into the local government militia. This report presents information on ongoing abuses committed by SPDC forces in Papun District from February to May 2009. Since the end of 2008, the State Peace and Development Council (SPDC) has withdrawn troops from 13 of 46 army camps in northern Papun District's Lu Thaw Township. Although the SPDC still maintains a significant presence in the area, villagers and internally displaced people (IDPs) report slightly increased space in which to pursue their livelihoods, including engaging in the current rainy season agricultural period. Nevertheless, the spectre of ongoing army patrols and potential reoccupation of abandoned camps continues to limit villagers' abilities to access and maintain farmland. This risks repeating cycles of food shortages begun in late 2005 with the advent of the SPDC's northern Karen State offensive. Civilians in Bu Tho Township to the south, meanwhile, are living under more complete SPDC control. Since early 2009, the SPDC has made villagers as unpaid forced labourers on road maintenance, as well as serve as porters and human minesweepers for army patrols providing security for the construction. Paddy fields belonging to two households were also destroyed during the construction. In the same time period, residents of each administrative section of Papun Town were forcibly conscripted into the SPDC's pyithusit ('People's Militia'). The majority of Lu Thaw Township remains outside of firm SPDC control. Although the SPDC has recently reduced the number of troops deployed to some areas in the region, most of Lu Thaw Township continues to be designated a 'black area' in which army patrols shell villages, destroy farmland and shoot villagers on sight. 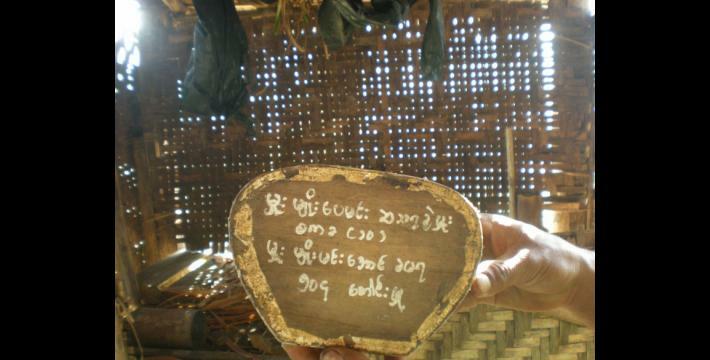 Residents of the Ler Muh Plaw, Saw Muh Plaw, Plah Koh and Yeh Muh Plaw village tracts, for instance, have been moving from IDP site to IDP site since being initially forced out of their homes in 1997. In late 2005, when the SPDC reinitiated its offensive in northern Karen State, civilians such as these became the main targets. 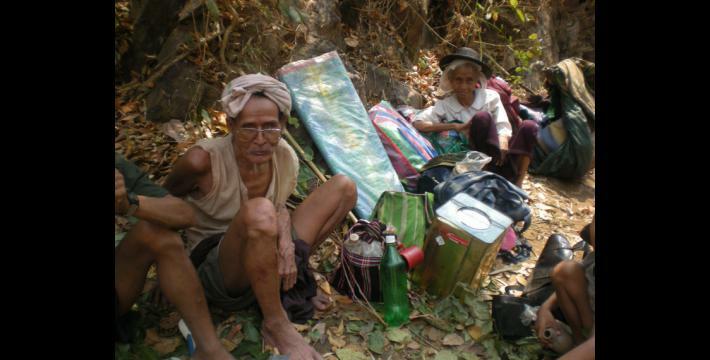 They had to leave belongings, homes and farmland to stay in forest hiding sites; others travelled further afield to refugee camps in Thailand. The majority of villagers in Lu Thaw Township have chosen to remain near their homes, but must work to overcome severe obstacles to reaping a full harvest from a healthy paddy crop. SPDC Army patrols have required farmers to balance the need to tend crops with the risk of being shot by any patrol that discovers them. Restricted access to farmland has meant that crops are vulnerable to damage by disease, wild animals, insects and weeds. Farmland and paddy stores have also been deliberately destroyed by SPDC patrols. Although villagers have consistently worked to farm their fields in spite of the obstacles, their harvests have been disproportionately meagre given the investments of time, work and risk. 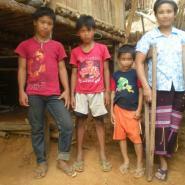 According to local estimates, as of June 2009, about 7,000 villagers in Lu Thaw Township faced severe food shortages. 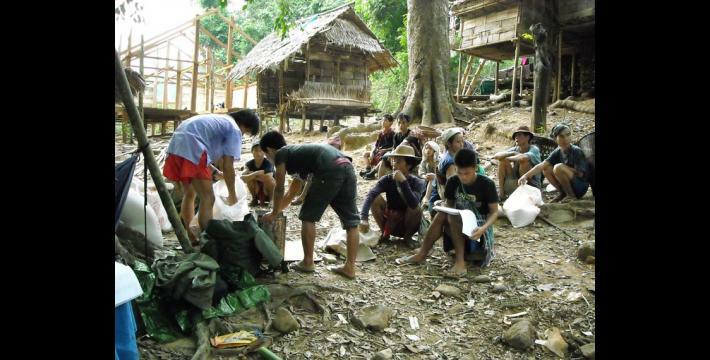 Villagers in Lu Thaw have been able to receive some support from the Karen Office for Relief and Development (KORD) and the Committee for Internally Displaced Karen People (CIDKP). 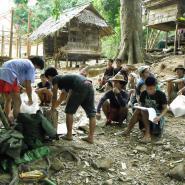 The army presence has limited distribution of aid, however, and some villagers report that they have only been able to receive support on one or two occasions over the past year. With the start of the 2009 rainy season agricultural period, villagers in Lu Thaw Township report slightly increased space in which to work. They worry, however, that if the Burma Army troops return, they will be forced to abandon their crops if they farm in places that were vacated by the SPDC. Increasing numbers of villagers seeking refuge at IDP sites, meanwhile, means that land for rotational hillside agriculture has also become limited. As a result, fields that should be left fallow for at least 7 years so that they can rebuild stores of nutrients are being used before they are ready, limiting potential for healthy crops before farming even begins - and risking a continued food crisis. "What we had was suffering, through experiences that occurred because of the SPDC. 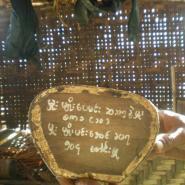 When the SPDC came, even though we're the original people to stay here, we couldn't stay in the village [anymore]. Whenever they come, they kill our livestock, burn whatever they see and attack our villagers. We have to flee up and down the mountain and sleep under the trees and in bushes. Whenever the SPDC comes, we can never go and work in the fields. They've made our lives very difficult." In Bu Tho Township, during January and February 2009 Light Infantry Division (LID) #11 continued repairs (begun in December 2008) to the motor road linking Papun Town to Kaw Boke village tract and the roads linking Kaw Boke to Kyauk Nya and Dagwin village tracts. 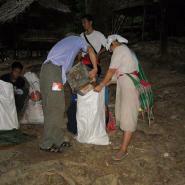 LID #11 forced villagers to fill potholes, transport dirt and stones, cut trees and perform other maintenance activities. Soldiers providing security for the construction also forced villagers to act as 'human minesweepers,' and walk at the front of army patrols. 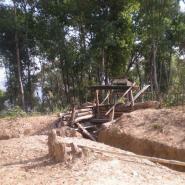 Land belonging to two farmers was also destroyed by the road construction. Eight plots of flat paddy field belonging to Saw P--- and Saw B--- were destroyed for the second consecutive year; the men were unable to farm four plots each due to the road construction last year as well. Just to the south, six battalions are currently based in the area of Papun Town. These include SPDC Infantry Battalion (IB) #19, Light Infantry Battalions (LIBs) #642, 340, 341, 434 and a Tactical Operation Command unit. LIB #642 is the most recent battalion to be based in the area and is responsible for the seizure of more than 50 acres of paddy fields from farmers in Meh T'Roh village, Meh Gklaw village tract. No landowners were compensated for their losses. Local villagers also told KHRG field researchers that they had received information about the construction of a new road into Papun, starting at the mouth of the Yunzalin River. If the construction goes ahead as rumoured, more land confiscation without compensation is likely. "Before they build their camp, we, the village heads gathered together and went and negotiated with them not to build the camp on civilians' fields... Then they said, 'even if you don't give us the land, we'll take it' ... The land that they confiscated is very wide: 50 to 60 acres. They call themselves the government; actually they should give land or develop land for the civilians. They shouldn't confiscate land that civilians own. They're the government and they should develop their own new place to stay, but now they don't do that and just confiscate the land they'd like to stay on from the villagers... It's not fair and not right." On February 23rd 2009, each administrative section of Papun Town was ordered to provide villagers to attend training for the SPDC pyithusit ('People's Militia'). In Section #3, the two villagers that attended the 15-day training were not provided compensation, though they were fed. 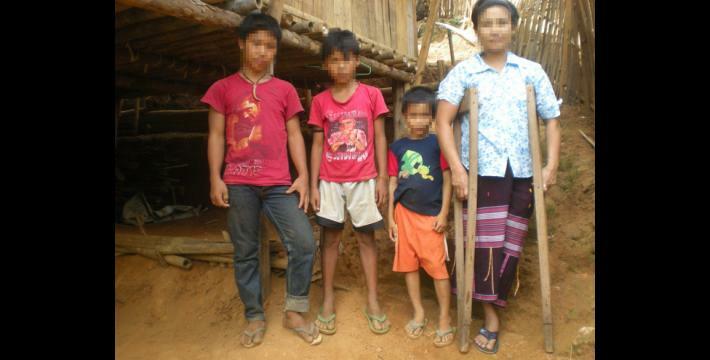 Because the trainings meant that the men were both unpaid and unable to provide income for their families, other residents of each section pooled together support money; in this way, the family of each recruit in Section #3 received 2,000 kyat (approx. US $1.82) per day. "They [SPDC] didn't give support to those persons' [villagers who attended the training] families. Then the villagers had to support the families of those people who went for militia training. If the villagers didn't do this, those people's family members who stayed behind would have had nothing to eat. 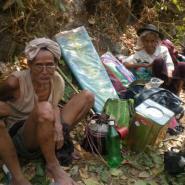 So the villagers must support those people's families with 2,000 kyat per day." The fact that 13 battalions have withdrawn from northern Papun District is a positive development for villagers striving to survive in the area. Food shortages created by SPDC destruction of food stores and disruptions to the farming schedule during the last agricultural season, however, mean that problems persist. 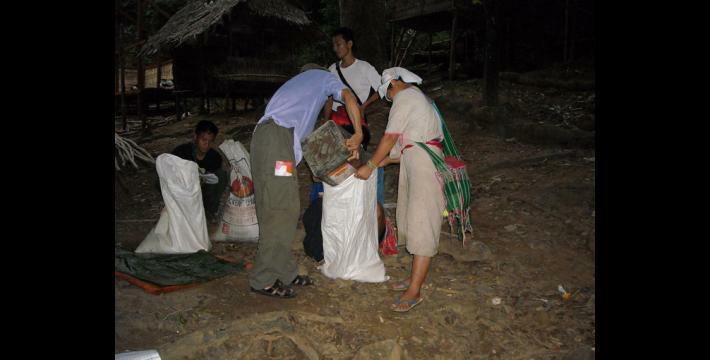 The current estimate for Lu Thaw Township is that 7,000 villagers are facing a severe food crisis. To the south, villagers continue to live with the burdens placed on them by more complete SPDC control: land seizures, forced labour and conscription as 'human minesweepers' and militia soldiers. Papun town is separated into several different administrative sections in order to better facilitate SPDC control over area residents. Section #3 covers the northern segment of the town.